In addition to using Yahoo! 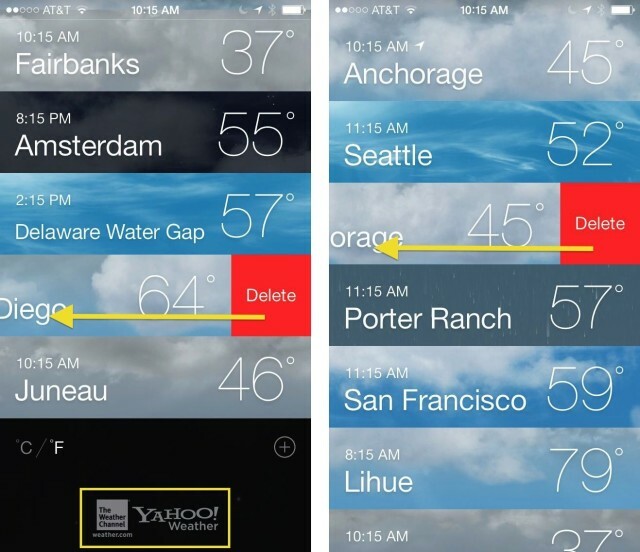 Weather data, the new Weather app in iOS 7 also borrows some of its look from the stellar Yahoo! weather app that came out prior to the release of Apple’s latest mobile operating system. One new feature that the built-in Weather app from Apple brings to the table is a way to see all the locations you check the weather for into one screen. Here’s how to access it. When you launch the Weather app, you’ll typically be taken to the screen for your current Location. You can swipe left or right to see the other cities you’ve added into the Weather app, or you can hit the little three horizontal line icon in the lower right to get a visually dynamic view of all the locations at once, complete with depictions of the current weather in those places. You can also simply pinch in to zoom to the multiple location list. On any main city screen, simply place your thumb and forefinger about an inch apart on your iPhone screen and pinch inward, keeping both fingers in contact with the glass. Make sure you don’t start too far out, or you’ll end up activating Control Center at the bottom, or Notification Center at the top. Now you have two ways to see all of your Weather locations. If you want to delete any of them, simply swipe to the left, as in the Mail app, and tap on the red Delete button.